(Port Townsend) -- The Sequim Wolves staved off the Port Townsend Redhawks 27-26 Friday night at Jefferson County Memorial Athletic Field in a prep football season opener. The Redhawks rebounded from a 27-14 deficit midway through the third quarter, scoring touchdowns on consecutive possessions, but were left trailing by a point with 6:21 to go after a fizzled two-point conversion attempt. Sequim was forced to punt on its subsequent possession and Port Townsend took over at its own 45 with 4:30 left. Facing a 4th-down-and-5 from midfield, Redhawks running back Detrius Kelsall was manhandled and stopped by the Wolves defense 2 yards short of a first down, turning the ball over to Sequim at the Wolves 47 with 3:42 remaining. Kelsall had game-high rushing honors with 99 yards on 25 carries and 2 touchdowns on the ground and another receiving. The Wolves bashed out 46 yards on the ground in the game's final 6 plays to run out the clock. Sequim sophomore quarterback Riley Cowan was red hot in the early going, completing 15 of his first 16 passes. Cowan made TD connections with sophomore Kyler Rollness from 20 yards and junior Payton Glasser from 7 yards as the Wolves led 14-0 with 7:27 left in the opening quarter. 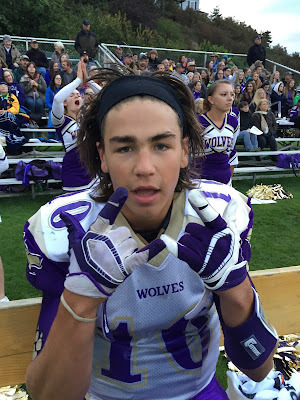 Glasser made his Wolves varsity football debut with 3 catches for 29 yards and a pair of scores, also intercepting a Port Townsend pass on defense. The Redhawks were unfazed and responded with a 10-play, 62 yard march, closing within 14-8 after Berkley Hill's 3 yard touchdown pass to Kyle Blankenship. Sequim extended its lead to 20-8 after Glasser made a diving 19-yard TD catch with 10:10 left in the first half. The Redhawks pulled within a score with 6:07 to go before intermission when Hill threw 3 yards to Kelsall for a PT TD, making it 20-14 Wolves. Hill completed 11-of-21 passes for 112 yards, 2 touchdowns, and was intercepted once. Sequim got another touchdown on a 4th-and-9 when Cowan found Gavin Velarde for a 24-yard touchdown pass with 5:18 to go in the third period, extending the Wolves advantage to 27-14. Velarde was the game's leading receiver with 13 receptions for 150 yards and a score. Cowan finished the game connecting 24 of 31 passes for 270 yards, 4 touchdowns and was intercepted twice. Kelsall got the Redhawks within 27-20 with 1:06 left in the third quarter on a 2 yard run, but the conversion run failed. The Wolves had a chance to salt the game away early in the final period, driving deep into Redhawks territory. However, Sequim's Keeshawn Whitney was stripped of the ball by a host of defenders trying to extend a 12 yard run to the Port Townsend 6 with 9:31 left. Whitney was the leading Wolves ground gainer with 46 yards on 6 carries, including a pair of punishing runs on the contest's final drive. Sequim (1-0) hosts perennial 1A powerhouse Montesano, a 54-20 winner over Aberdeen, next Friday. Port Townsend (0-1) hosts Port Angeles, a 40-0 loser to Mount Tahoma, next Thursday. Sequim -- Riley Cowan 7-(-20), Keeshawn Whitney 6-46, Gavin Velarde 3-16, Tyler Conn 8-39, Hayden Gresli 1-4. Port Townsend -- Detrius Kelsall 25-99-2TD, Jacob Boucher 3-7, Berkley Hill 11-75, Kyle Blankenship 2-1. Sequim -- Riley Cowan 24-for-31, 270 yards, 4 TD, 2 INT. Port Townsend -- Berkley Hill 11-for-21, 112 yards, 2 TD, 1 INT. Sequim -- Gavin Velarde 13-150-1 TD, Payton Glasser 3-29-2 TD, Kyler Rollness 6-82-1 TD, Curtis Gorr 2-9. Port Townsend -- Kyle Blankenship 3-14-1 TD, Detrius Kelsall 3-30-1 TD, Cole Crawford 1-14, Nico Winegar 1-20, Kyle Mackey 1-14, Jacob Boucher 2-20. Sequim -- 25 carries, 85 yards. Port Townsend -- 41 carries, 182 yards, 2 TD. Sequim -- 24-for-31, 270 yards, 4 TD. Port Townsend -- 11-for-21, 112 yards, 2 TD.